As the largest national locksmith in the UK, Keytek® is committed to ensuring that our local locksmiths are able to offer the very best in quality and secure products for both our domestic and commercial customers. All of our local locksmiths are able to supply and fit an ABS High Security Euro Cylinder, to ensure your uPVC or double glazed doors are not only meeting your home insurance requirements but are also ultimately secured for your peace of mind when it comes to your home security. 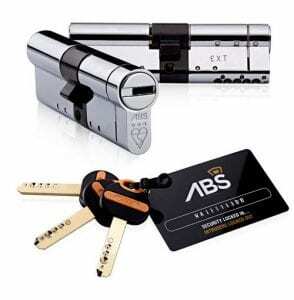 The ABS High Security Euro Cylinder is the only security cylinder currently on the market which has a TS007 3 star rating, SS312 Sold Secure Diamond Accredited and Secured by Design Accreditation combined. The cylinder is an ideal retro-fit or first fit high security euro cylinder which doesn’t require any additional security products such as high security handles or guards to meet your insurance requirements, although these can be fitted as additional security to your home. *Single or double sided cylinders under 30mm are not 3 Star Accredited due to the size of the cylinder, these will need to be fitted with a 1 Star Accredited handle. Avocet Hardware is a well known supplier and manufacturer of locks, handles and other hardware for the replacement window and door market. Although the Company fell on hard times in 2012, since being bought by the Jain family the Company has grown from strength to strength and has seen the increased investment in innovative products such as its Avocet ABS high security locks. The Company’s main initiative is to redefine home security, specifically in terms of the safety of uPVC and other double glazed doors and windows. This investment has seen the Company work closely with the Neighbourhood Watch to ensure that its members and the general public are aware of products that conform to not only British Standards but will provide their homes with added security.